Almonds are a fantastic source of lean protein, are considered a heart-healthy snack by the American Heart Association, and are featured in everything from milks to crackers to cheeses to beauty products. What Pitbull is to top 40, almonds are to specialty snacks—in fact, every day in the US there are over 31 million almond snacking occasions! But like the twitter messages of Jaden Smith, the story of the almond is poorly understood. The almond industry has faced recent backlash regarding its water use and intensive relationship with bees. And how do you differentiate fact from fiction? We know you might not have energy to do the research, so grab a few almonds and read on! California is the global leader in almond production, and with 1.4 million acres dedicated to this healthy nut, almonds represent more acreage than any other crop in the state! Take that, grapes! While there are a lot of almonds out there, not all almonds are the same. There are hundreds of cultivars of almonds currently being grown in California, and while they all look very similar, each type of almond is used differently depending on the end product. For example, you may find some Buttes in your almond milk, some slivered Montereys mixed in your granola bar, 7 nonpareils on Obama’s bedside table, or a pile of Peerless burying your cat. What about the white, skinless almonds in the bakery aisle? These are just regular California almonds that have been blanched, or briefly dropped in boiling water to remove the dark skins. Lots of baked goods recipes call for them, and you can do this at home! Don’t confuse supermarket blanched almonds with Marcona almonds, a specialty import from Spain that gained popularity in tapas bars and can now be found in most Whole Foods (check the cheese section) and Trader Joe’s (with the other bagged nuts). Marconas are more rounded and plump in shape, with a softer, more buttery texture similar to that of macadamia nuts. But let’s address the elephant in the email: water. In 2015, Mother Jones came out with a damning exposé on the water needs of the almond industry and the “ignorant hipsters” who drink almond milk. Almonds, like many other tree crops and parched hipsters, are thirsty. And not to spoil your Thursday afternoon pick-me-up, but a cup of coffee uses roughly 34 gallons, for a FOUR-OUNCE cup…and we both know your cup is not four ounces. Your 10-minute shower uses 21 gallons and your load of laundry uses 41 gallons. So it's all about perspective, and making the choice that's right for you! What’s the Dillio with Almonds and Bees? In recent years bees have become a darling of the food world: they have a lemonade, an ice cream, and Cheerios (and others!) campaigning on their bee-half to #savethebees and #bringbackthebees! But did you know that the almond industry is the largest user of managed hives in the world? Cool! However, this long journey is both taxing on bees and farmers alike. According to the USDA’s Agricultural Resource Services Database, Californian almond farmers spend roughly 200 dollars per hive rental and use on average 2.5 hives per acre. In a 1.4 million acre industry, this adds up to over half a billion dollars annually! In fact, it is the second highest cost for farms, after water. As you can imagine, trucking bees all around the country doesn’t do miracles for our honey-producing friends. While Colony Collapse Disorder is still widely misunderstood, many scientists bee-lieve that constantly moving hives makes bees susceptible to pests, parasites, and stress—all potential causes of our bees disappearing. But there is a new type of almond out there! One that’s good for growers and bees alike. It's called the Independence. The Independence is the first widely grown almond cultivar to self-pollinate—allowing farmers to rent fewer hives (money in the pocket) and bees to take a break. The cultivar has been bred over the last 50 years by Floyd Zaiger, the man behind the Pluot! 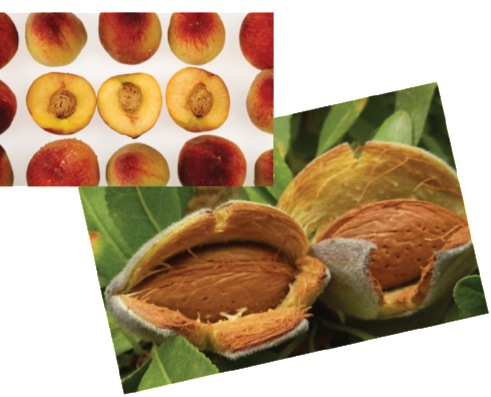 The growth in popularity of this almond is a win-win-win for farmers, bees, and newsletter readers alike! The brown skins of almonds are full of antioxidants, which are great cancer-fighters! They are an incredible source of Vitamin E, which has been linked to "lower rates of heart disease, cancer and Alzheimer's disease." They can help lower cholesterol. Pick roasted, salted, or savory flavored almonds only if you know that will satisfy your snack-appetite (or snacketite; you heard it here first). Otherwise, grab the unsalted & unroasted or avoid the roasted almonds with little saturated fat and no trans fat. Go organic to "avoid the GMO-based oils used for roasting and flavoring." Consider that bulk can be more expensive, and can go rancid: fresh is better, which may mean buying almonds that are pre-packaged and likely more economical! We debunked the myth that peanuts are nuts, and guess what? Almonds aren’t actually nuts either! And neither are walnuts or pecans, for that matter—all three are actually “drupes,” along with peaches, plums, and cherries. You can kinda see the resemblance to peaches! If you love to eat almond butter from the jar with a spoon, #youdoyou. You could also whip up these almond butter buckeyes—bonus points if you make your own almond butter (easy and more affordable than jars at the market!). It appears you’re kicking back with sophisticated bonbons, but really you’re getting your almond butter fix straight to the face. Plus, chocolate.